One day. 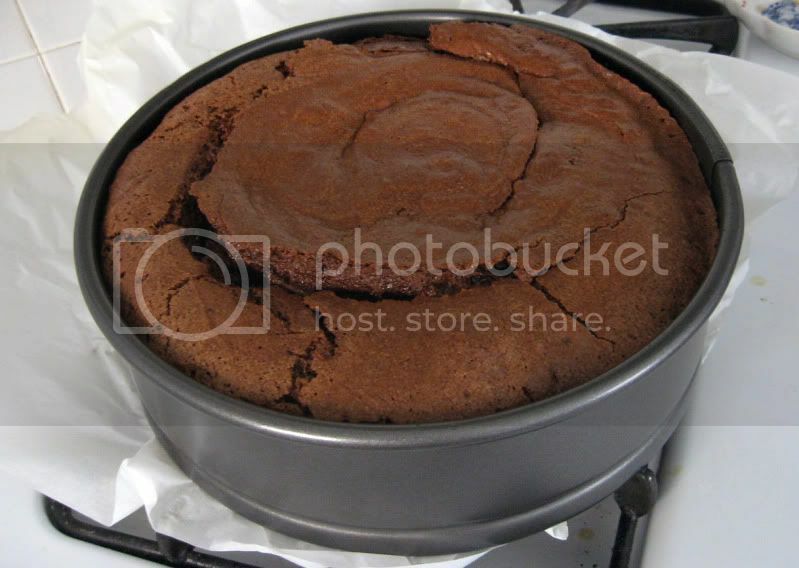 One day I will make the little mini molten chocolate cakes that I have been wanting to make for a while now. But this weekend did not provide that day. This weekend had another day. 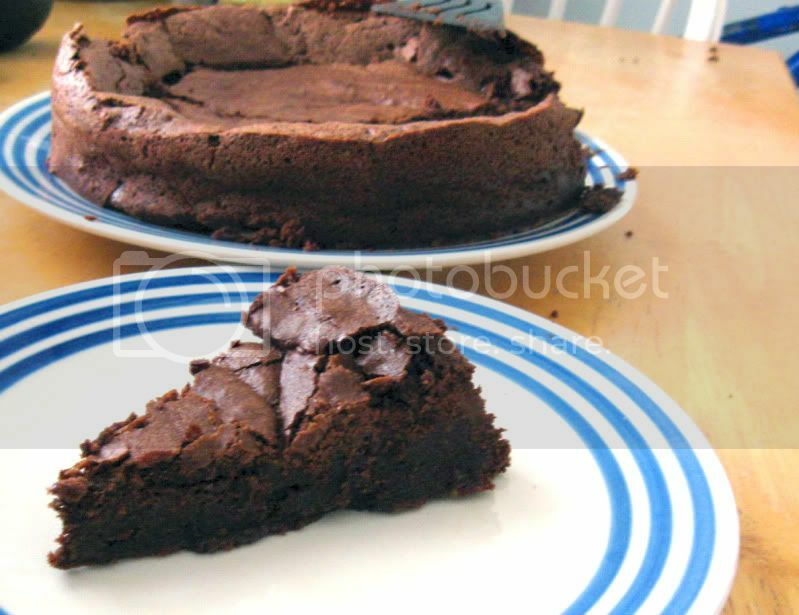 A day devoted to... flourless chocolate cake. You see, I recently bought a springform pan so that I would be able to make this sort of thing. And cheesecake. One day there will also be cheesecake. But if you are a chocolate fiend, like I know some people that read this are, then you will surely love this. It's dense. It's rich. It's oh so very chocolatey. For me, it's a little too much, but I'm sure others would think that's crazy talk! 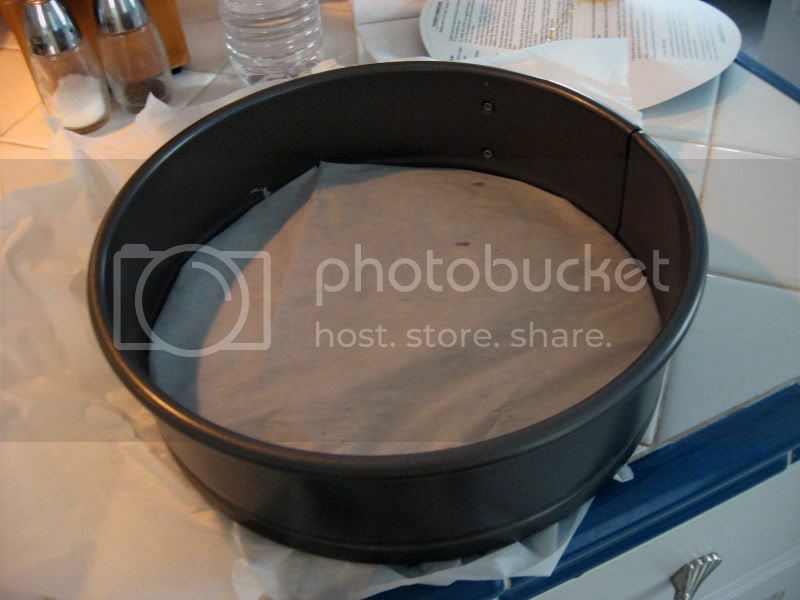 Start by lining your spring-form pan with parchment paper, making sure to clamp it down inside so it stays. Spray with non-stick spray as well. Preheat oven to 325F. Separate your six eggs into two bowls, the whites into a larger one that you can mix later. 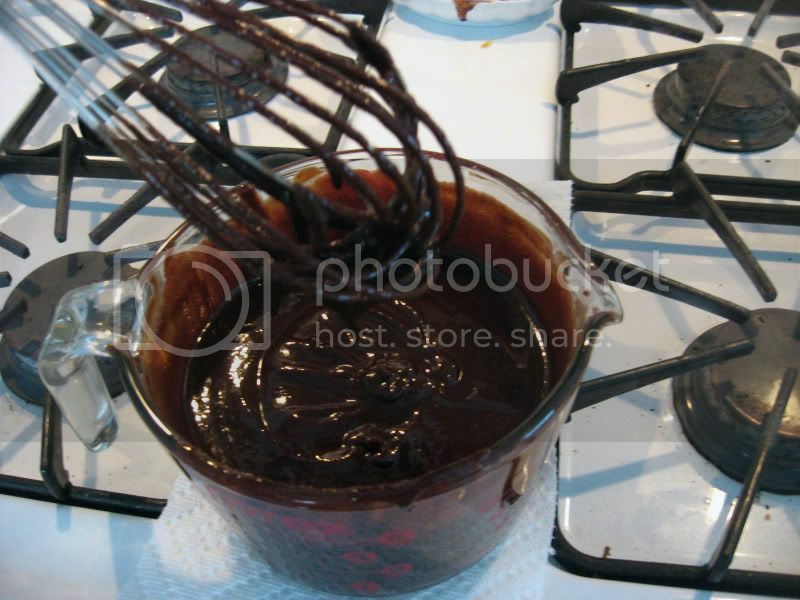 Melt the butter and the chocolate together either over a double boiler, or you can microwave in 30 second intervals, stirring in between each zap until it's smooth. 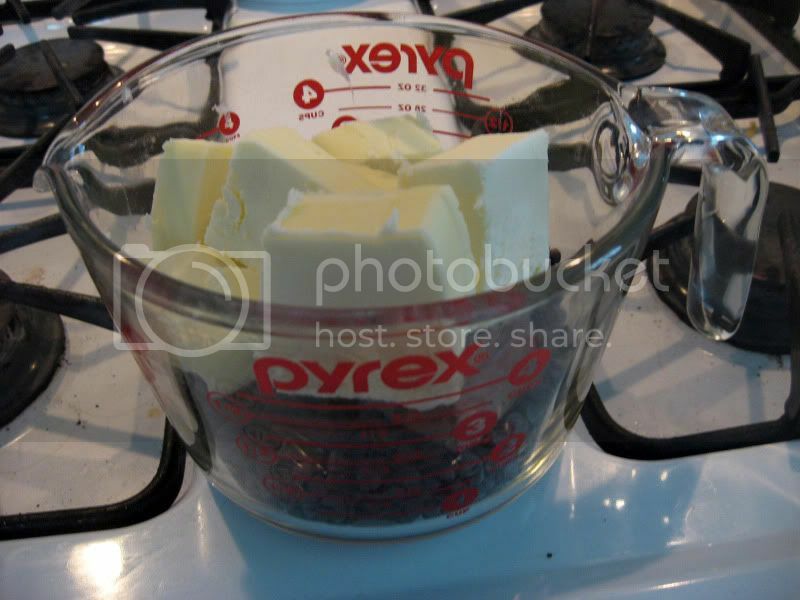 If you use the microwave method, make sure you cut up your butter into smallish chunks so they melt faster. 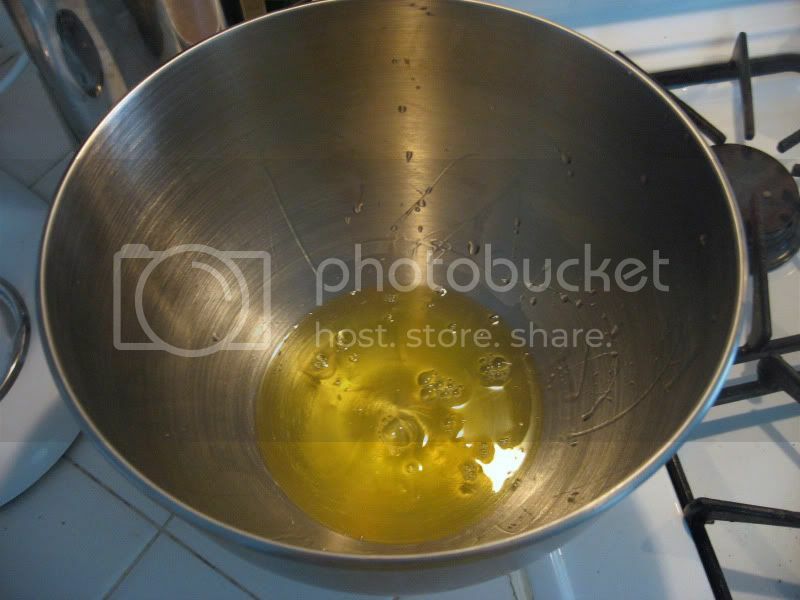 Whisk in the sugar and then the egg yolks one at a time. 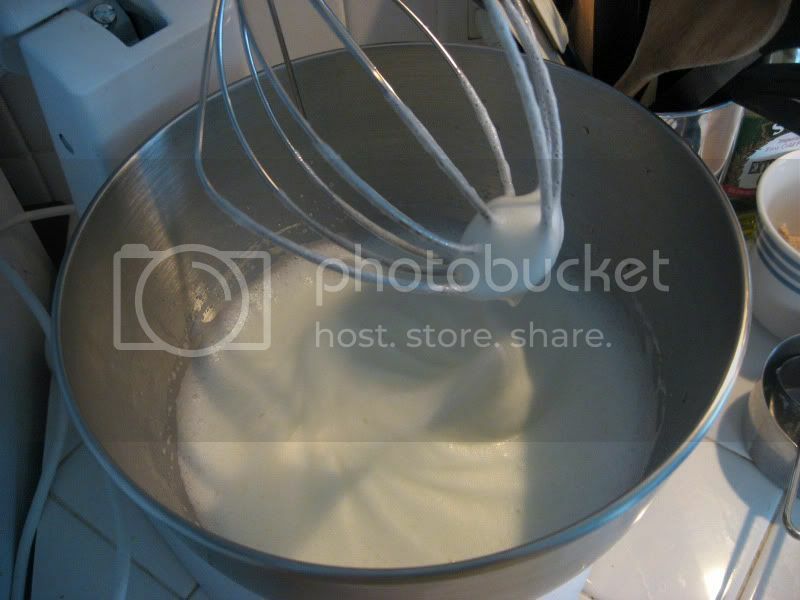 Whip the egg whites until they form stiff white peaks (easiest to use an electric mixer for this or you will be doing it a long time with a whisk). 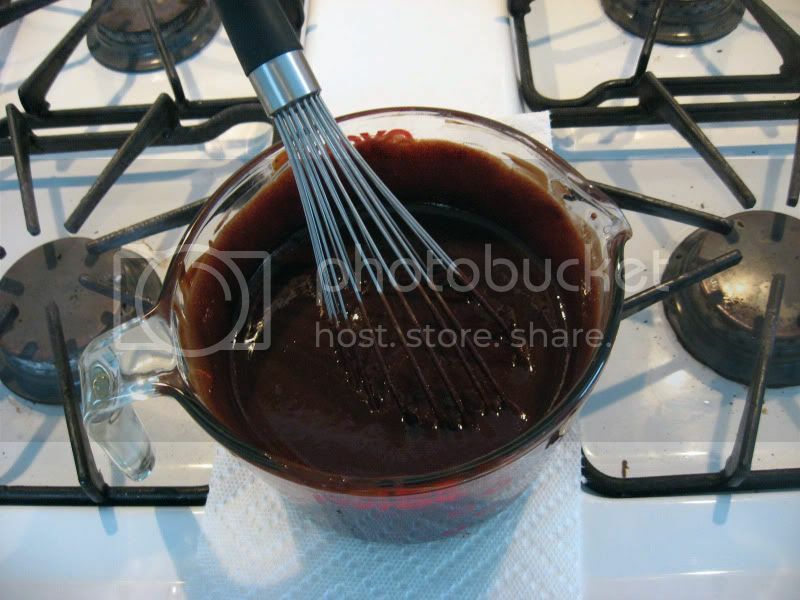 Gently fold the egg whites into the chocolate mixture until mixed well. Bake at 325F for one hour, it will rise very high, but rest assured, it will fall later. Let rest for one hour out of the oven, then put in the fridge for another four hours. Yes, there is a lot of waiting. Do you know, I'm still not sure I did the parchment right? Is it supposed to go up the sides on the inside? Wouldn't that mean you'd have to put more than one piece in?! So confusing. I just did the bottom. It was fine. This is a time I was wishing I had a larger Pyrex bowl. Oh well. The chocolate and the butter about to go into the microwave. Meanwhile, separate your eggs. 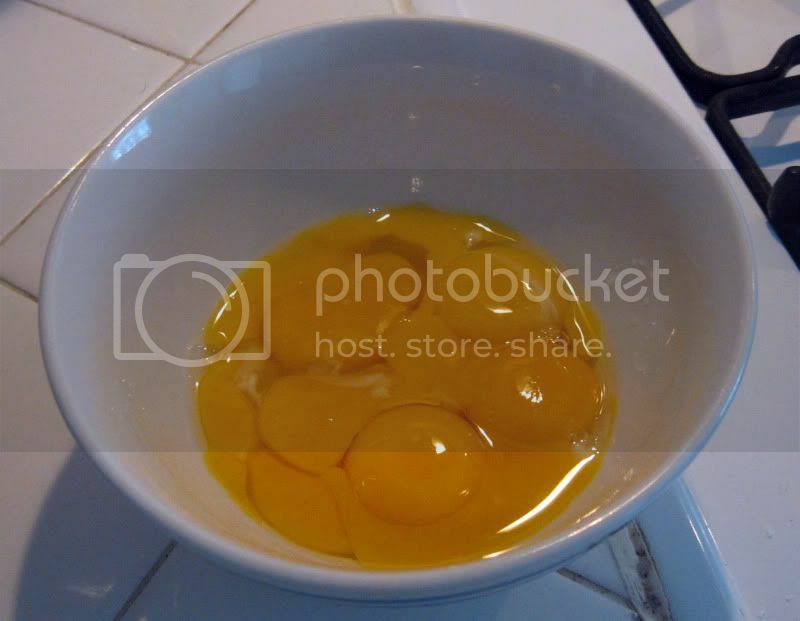 The yolks can go into a regular bowl, but the whites need to go in a larger mixing bowl. After the sugar has been added to the chocolate/butter stuff. You can't really tell, but yes. And with the egg yolks. You see, this is why I wished I had a larger bowl! Look what happens to egg whites when you mix them around for a while! Isn't it crazy?! 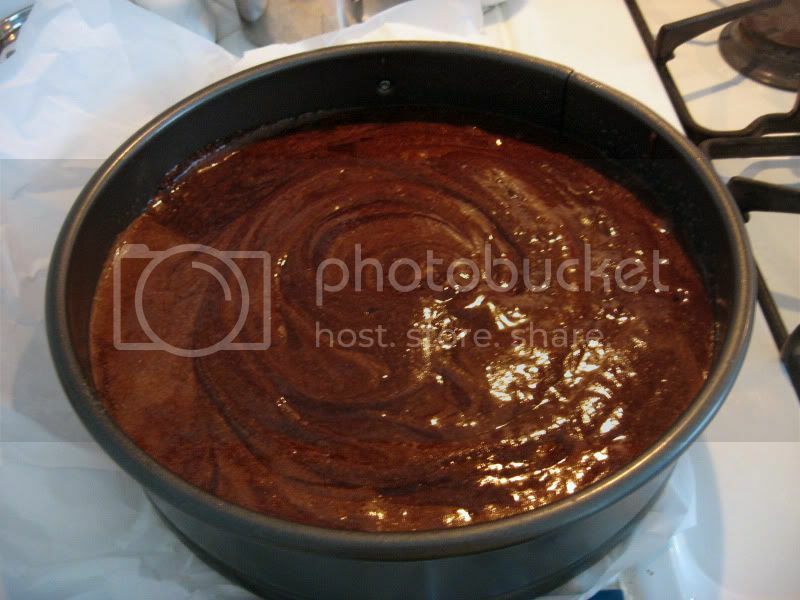 After you fold in the whipped whites into the chocolate stuff, pour it into your prepared pan. I love those swirls. It'll come out looking like this. Poofy. Don't worry. 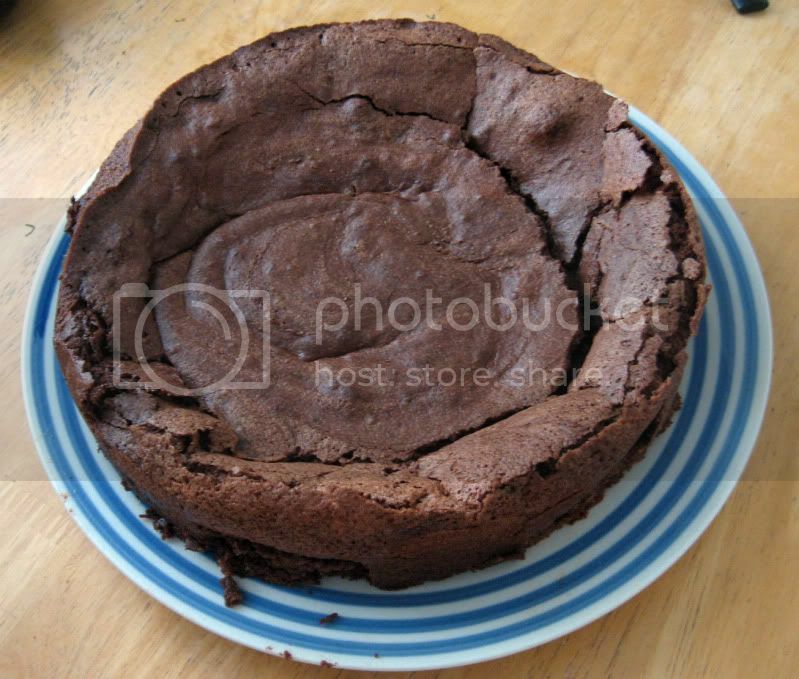 Once you let it set for an hour, and then put it into the fridge for four hours after that, and you take it out of the springform pan... it will look like this. It really is a lot of waiting! But by the end, you get to have a piece of this very rich chocolate cake. 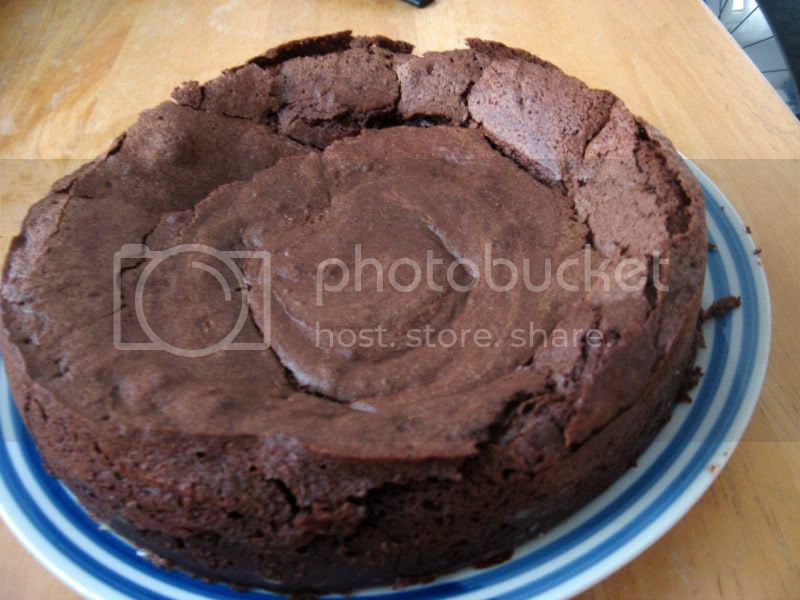 It reminds me of brownies, really. And that piece right there? Too big! Maybe if it was tempered by some whipped cream or vanilla ice cream it wouldn't seem so intense, but on its own? Whoa. Crazychocolatetown.